Halloween is easily my favourite holiday of the year. Sure, Xmas gives me the warm and fuzzies but it's Halloween that makes me have sleepless nights and a twisted tummy bubbling with anticipation. I host a party each year and take costuming quite seriously. But enough about my obsession... 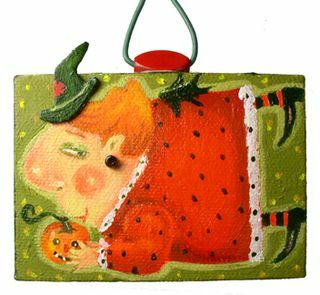 I thought in honour of the festive season I'd feature an artist whose work features Halloween themes! It's possibly a little known fact that I have a soft spot for folk art. Maybe it was all the years I spent in the giftware industry. Not the geese-and-checkerboard sort that is well known, but the modern take on it. 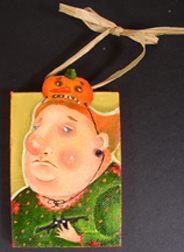 Especially with Halloween stuff, I'm pretty into folksy takes on the look. Suzanne Urban is an illustrator who works primarily on product design and surface pattern. Her Halloween stuff is so fun! And unique. 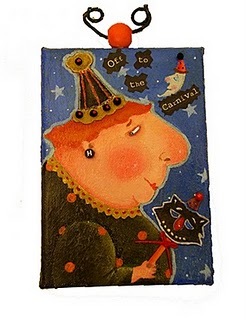 She has a degree in studio art from Marymount College and has worked for greeting card companies, publishing houses and newspapers, among others. Her style is neo-folk, which to me means that it is informed by other styles of art, and a skilled hand, but isn't so much simple as it is based on simple themes, shapes and concepts. She has a day job in an elementary school, and lives and works in Connecticut. Suzanne is a juried member of EHAG (I just learned what it is! 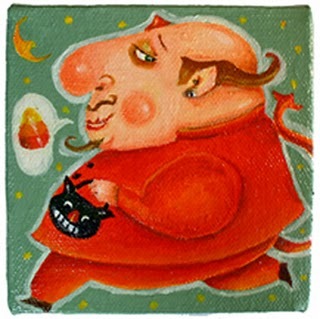 Eclectic Halloween Artist's Group...um, how awesome is that? ), and has been published by McGraw Hill, Scholastic and the New York Times. She's currently working in licenses for a gourmet ice cream company and has in the past worked on stamps, stationery, greeting cards and needlepoint patterns. 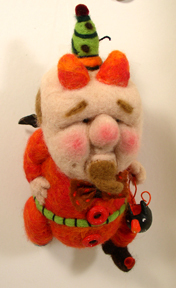 Suzanne makes these cool felted dolls too. 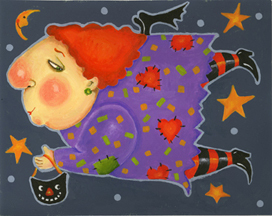 And have a very very happy halloween!